I find it exciting to be practicing dentistry today with the availability of dental implants. I particularly enjoy helping those patients who lost not only multiple teeth, but significant quantity of supporting bone. Whether this type of defect is a result of face trauma or gum disease, the entire face is affected. The mouth has a sunken appearance with pucker creases along the lip line. A hybrid denture, also called a fixed detachable denture, restores the youthful contour of the lip and pleasing smile. With a hybrid denture in the upper jaw there is no need to cover the roof of the mouth as is the case with traditional removable partial and full dentures. Since the taste buds on the roof of the mouth are not covered, there is no loss of taste sensation. Also, those patients with a strong gag reflex benefit greatly by having the hybrid denture replace their traditional removable. 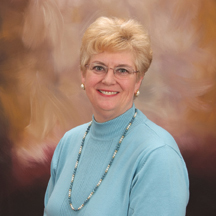 A hybrid denture is one of many implant retained tooth replacement options. The decision to treatment plan this type of devises is not a simple one. There are many factors to consider, including the patient’s health, time and financial commitment, biologic factors such as the quantity and quality of available bone. The patient’s ability to adapt to something new in his or her mouth is another important factor. 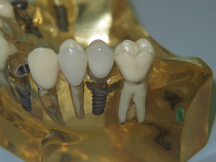 Just as critical is the patient’s ability to clean the implant retained prosthesis. It is imperative that any devise in the mouth be kept plaque free so surrounding soft tissues and bone can remain healthy. Not all individuals have the fine motor skills in their hands necessary to achieve this goal. For example, patients with significant arthritis in the hands or neuromuscular diseases would not be good candidates for the challenges a hybrid denture presents. Since the hybrid denture only removable by the dentist there are greater challenges in keeping the prosthesis clean. When the hybrid is well designed for the right patient it is well worth the extra effort. Design is key. The desire to allow enough space under the fixed hybrid denture to allow cleaning devises to easily pass through must be balanced against the need to keep an air seal. The seal at the tissue side of the hybrid denture is necessary for proper articulation. When we pronounce words, we modify the escape of air from the lungs with the tongue, lips and teeth. If the hybrid denture is placed with too large a gap between denture and the gum, air will escape. Without a proper air seal, a speech defect may be heard. 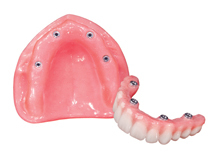 The hybrid denture is an excellent tooth replacement option when fabricated for right patient. It is just one of the many implant retained tooth replacements which change lives. A dental procedure which allows you to chew comfortably, smile confidently, and know that a cough or sneeze or belly laugh will not cause embarrassment, is a valuable service indeed.